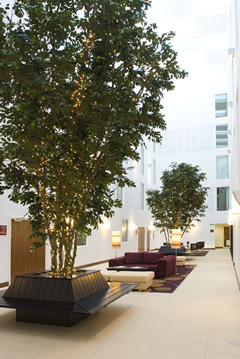 The Courtyard by Marriott London Gatwick Airport is a newly built hotel, decorated and furnished in a modern contemporary style to a high standard. 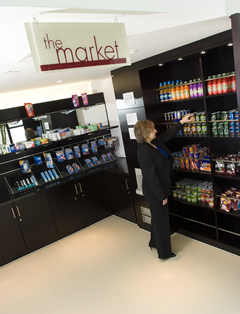 It is located within walking distance of Gatwick's South Terminal. En-suite bath/shower room, Climate control, Coffee/tea facilities, lap top safe, hair dryer, alarm clock, Flat screen TV with movie channels, Iron & board, High-speed Internet. Family accomodation will be 2 x double bed for families of 4 and double, sofa bed and rollaway bed for family of 5. Central lifts to all floors (19 ground floor rooms). Cots charged at £10 payable at Hotel. 11 accessible rooms available, (2 of which have an interconnecting double room). Overnight parking at the hotel is charged at £25.00. Volare, a 120 cover stylish restaurant with and a la carte menu serving Mediterranean cuisine and Volare Bar/Lounge set in the heart of the hotel serving sandwiches and light meals. Fitness room with weights and cardiovascular equipment. Children sharing room with adults should be 12 or under. Children aged up to 16 can stay in interconnecting rooms at reduced rate (available on request). Cots in the room are subject to availability and are charged at £10 each payable on arrival at hotel. The hotel was very convenient to the airport, our room was clean and had all the amenities. The room was too warm and the air conditioning was not working which meant an uncomfortable night. Very comfortable room and excellent breakfast- will return. I do not own a car, I did not drive to the hotel and therefore I did not use the parking . Lovely clean welcoming hotel. The meal in the the restaurant was of a high standard and very reasonable priced. Nice hotel and good location to airport. Didn't like the Â£50 "deposit" (by way of a credit card swipe) that we had to provide when we arrived at the hotel. When I checked this the next day I was told the transaction would be cancelled as we hadn't charged anything to our room. Not had my statement yet so haven't been able to check. We were not given a receipted bill when we left either. Was not a parking service. Reception demanded a credit card which they placed a temporary charge on even though my room was pre-paid. I called Reception at about midnight to change the time of my alarm call but nobody was answeringt he phone so I had to get dressed and walk down to the Reception. Very poor. I will NOT use this hotel again. 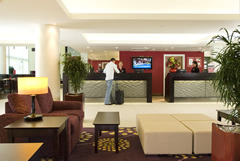 I have never stayed at an airport hotel before it takes away the worry of arriving for an early flight so I recommend the service and I wil certainly use it again. Reasonable price, helpful and efficient staff. Room comfortable and adequate for family of 4. The meet and greet was also very efficient. Overall experience was good. The hotel was lovely, only problem we had was the meet and greet service. We were told initially before we left for our holidays that we would be picking our car up outside the Sofitel but when I phoned them I was meeeting them outside the Premier Inn. When I rang for my car to be delivered it took them nearly 20 minutes. When we saw my car the person was driving very slowly and drove passed us. When he eventually parked up I had to bang the passenger window as he did not open the car door. Whe he got out he said it was no need for that and walked off. When we put out luggage in the car, we noticed there was no keys. I got out of the car and the bloke then came back to the car to give me the keys after he scanned the documentation. Because of this I was not happy with the service and it would have been quicker to have picked the car up from the hotel. Very good apart from the dining on the day being cold. Hotel is located at the entrance to the South Terminal at Gatwick. An easy 10 minute walk to the terminal. Food and drink prices can be expensive. Within walking distance to Gatwick. signs to indicate that you have to check-in to drop car off with Maple Manor when an all inclusive package has been purchased (hotel & parking) would be useful and could reduce some queueing. I walked from hotel to check in desk at departures, took hardly any time at all, follow signs along the pavement, very easy. (if it was raining I would have got the transfer bus which runs every 20 minutes.). Best bit they bring your car to airport on return all went well would use them again. Easy 5 minute walk to the Airport. Will stay at this hotel every time we fly from Gatwick. Follow signs to Gatwick Airport and then to South Terminal. As you enter the slip road into South Terminal take the first turning on your left, (also signed to Schlumberger House) and the hotel will be on your right. 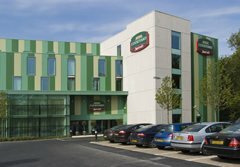 The Courtyard by Marriott, London Gatwick Airport is not responsible for cars left at any car park including the on-site car park. Cars are left at the owners risk. 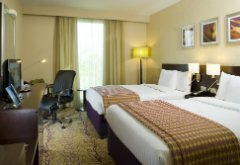 If a customer has arranged for a cot in their room at the Gatwick Courtyard by Marriott, they must bring their own bedding. Please note all guests who request a cot in their room will be advised of an additional £10.00 per night payable on arrival at the hotel. Cots will still be issued on a first come first served basis and cannot be guaranteed. does this price include parking ? Also there are 4 adults travelling what are the sleeping arrangements please?If you require car parking there is an option on our website to select with or without parking. If 4 adults are travelling you will need to book 2 double rooms. Does the hotel offer a shuttle bus to the North Terminal and how long does it takeWith the meet and greet - can the car be bought to the North Terminal?The airports shuttle bus operating every 20 minutes. Bus takes approx 3 mins to South/North Terminals. from 04:00 am till 12:00 am. Regarding the Meet and Greet service the car can be bought back to the North Terminal on your return. All details for the return are taken when you check-in at the hotel.